Our Superior Hotel Rooms are located in a separate building which features a lazy river pool leading to a lagoon pool with comfortable loungers. Each room can accommodate three to four guests. These rooms are ideal for either families with two children (4 guests) or adults (up to four people). The rooms include a double bed or two twins; a sofa bed for one or two people; a camp bed can be added if needed. Kissos Hotel superior rooms have a lagoon pool view. 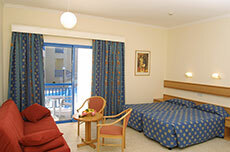 All ground floor rooms have direct access to the pool. Our superior hotel rooms are located on the ground and first floor. Access to the first floor is by stairs only. Two rooms have been designed for disabled guests, with bathtubs.